The Links kicked off the New Year with a visit to Lotus Valley, which has long been a favorite of the regulars; the immaculate conditioning of the course and usually empty car park offsetting the long journey, although most agreed the greens could do with speeding up a little. As Lotus Valley is a little short off the white tees, the 25 participants were given the choice of which “flight” to join, with 11 choosing the blues at a little over 6,500 yards and 14 choosing the whites, playing nearly 400 yards shorter. In the White Flight, Joe McArdle showed a return to form, carding a gross 79 for 41 points, narrowly edging out Sean McNamara on count back with a better back 9 of 20 points to 19. Barney Sheedy was 4 points back in third place. Although a strong field including 6 single figure handicappers chose to tackle the blues, the lack of run on the carpet-like fairways saw the course playing longer than its 6,527 yards, and points were much harder to come by, with only Peter Kelly managing to equal his handicap, limping home with 14 points on the back 9 after a fantastic one over gross front for 22 points. Grant Cadell finished second with 34 points and Mark Stanley completed the places with 32. The windy conditions and threatening showers did not put off the golfers as 23 made the short trip to Phoenix to play the Lake and Ocean courses, again ensuring two flights, but this time split more conventionally by handicap, with 12 players in the 0–16 category and 11 at 17+. The “ease” of the wide fairways was as usual offset by the fast greens, meaning points were earned rather than given. In the B Flight, Fred O’Connor took the spoils with a hard earned 34 points, one ahead of both Ted Murphy and Sean Hallahan, with Ted taking second on count back with a better back 6 of 13 to 12 after both carded regulation 18 points on the Ocean course. In the A Flight Barney Sheedy edged out Jon Batty for first place. Both players scored a creditable 37 points, with Barney having the better back 9 of 21 against 18. John Chambers completed the places two back with 35. Things got even better for Barney as he scored the only ‘2’ of the week, taking a triple rollover pot with his birdie at the short second on the Lake course. 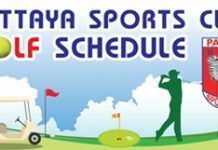 Note: The Links depart from the hotel on Soi Buakhao at 9.30am on Tuesdays and Thursdays and 10.00am for Pattaya Country Club every Sunday. Sign up at the hotel or contact Jon on 080 021 1034. A full schedule of courses can be found on the IPGC website2 www.ipgc.org. Previous articleThe Pattaya Mail office was kept busy all week as friends and businesses associates dropped by to wish each other the best of luck for the New Year.